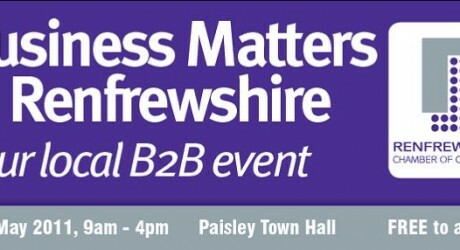 RENFREWSHIRE Chamber is hosting its first free B2B (business to business) event, Business Matters in Renfrewshire, at Paisley Town Hall from 9-4pm on the 19th May 2011. The free to attend event has been designed to help businesses of all sizes and sectors, grow and prosper and showcase how local companies can improve how they do business. In addition to established companies, the event will cater for those interested in starting up a business, a career change or a student wishing to find out more about business. Commenting on the preparation for the event, chamber chief executive, Bob Davidson, saidL “All the exhibition slots and seminar slots were full six weeks before the event. “We have managed to attract a great mix of companies and organisations who will be able to help businesses improve how they operate and, given the economic climate, we all need to look at how we can do things better. Renfrewshire Chamber of Commerce help Renfrewshire businesses of all sizes and sectors grow and prosper. We are a fully-accredited Chamber established in 1964 and based at Glasgow Airport. We have two local Chambers affiliated to us – Greenock and Helensburgh and across Renfrewshire represent 500 members / 30,000 employees. We are a very active Chamber and ran 90 networking events in 2010, provided free business mentoring to 150 companies and processed over 10,000 export docs. To read about how we can support your business and find links to follow us on all the main social media sites please visit www.renfrewshirechamber.com / 0141 847 5450.